Hoodie Scarf from d-made.com! This is my mother’s birthday gift, which isn’t until early Oct but I was really excited about the pattern I figured I get it done early. Plus, knitting on a deadline while moving is probably not a good idea. Where the heck did these time management skills come from!? And seriously, the pattern is good. I looked around quite a bit for a cool hooded scarf a few months ago and was disappointed. Then d-made came along and made everything all better. There's enough to this pattern to keep you entertained and easy enough to finish in a short period of time. Not exactly knit-stant gratification, but satisfying nontheless. 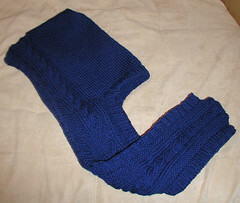 Since this is my third FO from d-made I think that warrants an official link in the “Awesome Knitting Resources” section. So check out d-made’s quality, free patterns. NOW! And since I’m on a roll with this gift-knitting I decided to start on my MIL’s birthday present which is in late-Sept. She’s getting socks made from some Knitpicks Simple Stripes. I'm following Knitty's Socks 101 tutorial for this, so it's nothing fancy. I’m about half-way through the first sock so it looks like I’ll be finished with this ahead of schedule as well. Nice! What's a Knittah to Do? I was going to frog my self-designed tank, but I'm really not in the friggin' mood. 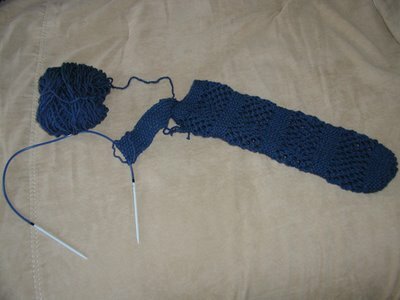 I'm so tired of ripping and re-knitting the same thing over and over. I needed a new, smaller project. My mom's birthday is coming up in early October and I finally found a hooded scarf pattern that would be perfect for her. It's the Hoodie Scarf from D-Made. My mom requested one of these because she hates hats (since she styles her hair, unlike myself), but the winter chill is just too much to go without any insulation sometimes. She requested this last winter, but I couldn't find a pattern and I wasn't particularly inspired (or confident) to create my own. I CO for this the other night and I'm moving along nicely although the scarf part is kind of boring. But once I get to the hood part things should liven up a bit. I'm starting pretty early, but that's ok. I hate having to knit things at the last minute and feel rushed. Plus, my mom is visiting in late Sept so I want to give it to her then. PLUS, come mid-Sept Mr.V and I will be moving so I won't have time to fool around with last minute gifts. Plus, - just kidding. I'm done rambling. Oh yeah, question: I need some project ideas that would be good for a 4 1/2 year old boy. I could go the stuffie route, but I've kind of done that already. I thought maybe a cool scarf or hat. He likes trains. I mean really likes trains. 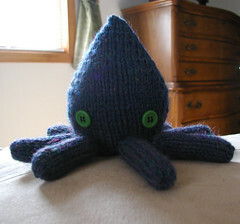 I don't know if I want to knit him a sweater because that's just not any fun for him. Anyone have any ideas? Click HERE to see some pics of our Boston trip! Ok, I'm back. First off, Boston was awesome! I had a great time, but now I'm bummed to be back to the same old, same old. Here is some stash enhancement I procured while killing time in AC Moore in Danvers, MA. This was my first ever AC Moore experience, and it definately won't be my last. 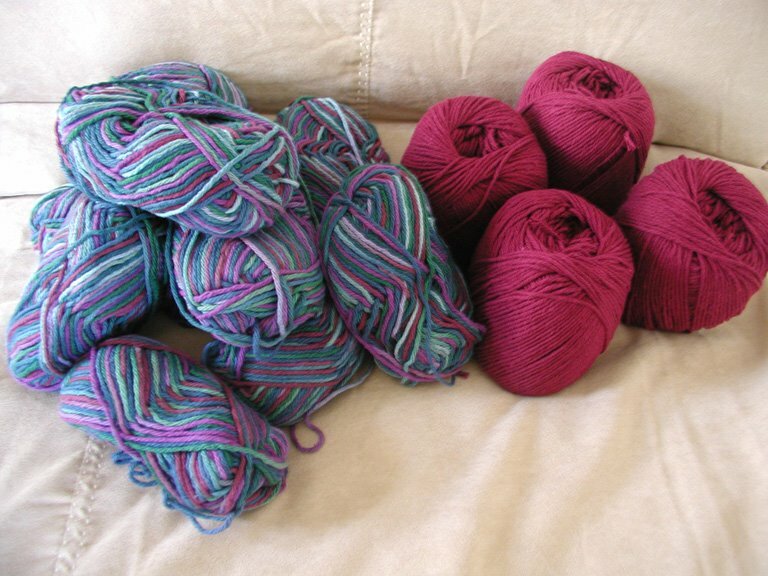 "Mill Ends" 1lb bags of 100% cotton yarn. $5 ea. I got two bags and now I'm up to my ears in the cotton yarn. There are no labels but if I were to guess the multi-colored one is Bernat Handicrafter and the wine colored is Sugar n'Cream. Not that it really matters. Hooray for cheap yarn! If all AC Moore's are like the one in MA I think they definately top Joann's. They have a wider selection of yarns I actually want to knit with. And I thought their prices were slightly better than Joann's as well. It didn't. I have absolutely nothing to show for my several hours of knitting the Licorice Whip pattern, and here is why: I got about four rows in during the drive to and then I realized I had to make even more pattern adjustments. 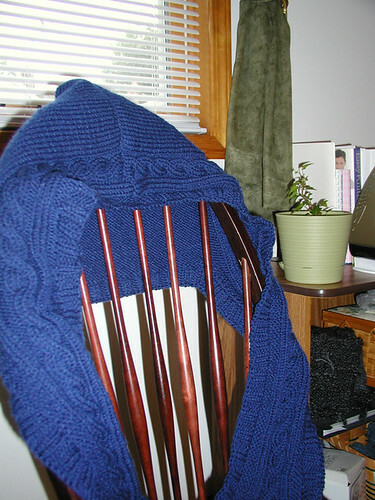 Then, I had to knit back a couple of times, plus I didn't realize how much a pain 100% cotton yarn could be. Progress was slow. So by the time we arrived in Salem, MA I had about 1.5 inches of sweater. It was at this point I realized that I was NOT finishing this sweater during the trip. But I continued knitting in the hotel before bed and on the drive (though not as diligently). I even worked on it after we got home. At about 10pm last night, I flipped the page of my pattern and realized that there was a whole other inc row in the increase set. I counted my stitches and I realized I was not increasing enough along the raglan lines, (stupid computer print out >.<) So, I had to frog. The whole. F-ing. Thing. So I now I have nothing to show for effforts which is extremely upsetting (not to mention a tad-bit embarassing). So now, I think I'm going to return to the Trial and Error tank and make my adjustments to that. Man, it seems like forever since I've finished anything. I'm even thinking of ditching the Licorice Whip completely and knitting something else with the yarn. It's a lovely pattern, but I'm a little po'd with myself and I need to take it out on something. Sorry, sweater. I'll post some Boston pics on my Flickr account soon! The Challenge: Knit an entire project from start to finish, sitting shotgun while traveling to and from vacation destination. Ok, here is some knitting content as promised. This what I've been working on lately. It's the umbrella cozy I keep talking about. It's not quite finished yet, but I figured I'd share it since I think it's fun to make this site slower by adding yet another pointless picture(bwah-ha-ha). All I have to do is finish the strap and I'm done. Yippee! What exactly is an Umbrella Cozy, you ask? Well, it wraps your umbrella in knitted goodness and since it has a strap you can sling that bad boy on your back and you're good to go. This idea came about from scanning the umbrella rack at Wal-mart in search of a more travel-friendly umbrella. But you see, they're all freaking small and uber-flimsy. I like my big, heavy umbrella. But it's heavy and has no strap, not even an ergonomical handle. My umbrella was crying out for a knitted accessory! So I grabbed some inspiration from the Yoga Mat Bag in SnbN and started knitting. I'm kind of liking how this is turning out so I think I'll post a pattern when all is said and done. Fair Isle Knitting by Sarah Don: This is copyrighted 1979 and is comically outdated as far as the patterns go. But what attracted me to this book was the 20 pages or so of fair isle motif samples. Well, that's pretty cool. So all I have to do now is actually learn how to knit fair isle. The Sweater Workshop by Jacqueline Fee: I've heard this pretty good for helping you design your own sweaters. We'll se what it has to offer. Umbrella Cozy pattern coming soon. Also, the Boston Knit-a-thon! Welcome to the all-new Eat-Sleep-Knit! I didn't feel the generic Blogger template was really a unique reflection of me, as corny as that may sound. I want to make impression, dang-namit! And as some of you may know I would like to start posting some patterns so I felt that this place needed a cleaner, more professional look. In order to do that I had to immerse myself in the basics of HTML and CSS and I read up on some good ways to personalized your site and increase traffic. Easier said then done. There is definite potential for this stuff to turn your brains into gloppy-goop. But don't let that intimidate you. Stop Two: The elusive 3rd column. I just really like the look of 3 column formats. I needed to have one, but alas, three column-ers are not offered by Blogger. But that's where Pam Blackstone at Random Bytes comes in! 3 Cheers to Pam Blackstone! NOTE: to view all three columns you must have your window fully maximized. Stop Three: Ah, color! Sweet pigmented, visible energy! It's brightened up a bit and I think this works quite well. If you think the background color is a little over-powering though, please let me know. I care about your retinas, really I do. And the rest is self-explanatory. I hid most of my profile info because it pushed other important sidebar content too far down the page, plus this site isn't about ME it's about my knitting. So I wanted to make that the overall focus. But you can still access my personal info (at your own risk, of course) by clicking on my profile link. Here is a list of the on-line resources that helped make this possible. Check them out! Knitting content will resume shortly. Ta!